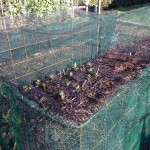 Mini cloche covered in mesh and polythene. Needs ends and weighting down to prevent it blowing away. 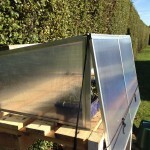 Half a twin wall cloche from The Warehouse used for seedling raising on a pallet potting bench. Windbreaks made from concrete reinforcing mesh and windbreak mesh with bird mesh over the top. 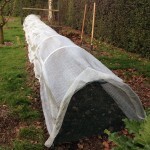 1m wide Cloche hoops covered with frost cloth and windbreak ends. I’m always interested in seeing other people’s gardens because they’ve usually devised a host of protective devices for edible crops. We need defence from pests such as slugs, birds, rabbits, cats and dogs. We need defence from weather such as frost, sun or wind. When we start gardening we resist using these because they take work, need to be stored and don’t look that great. Unfortunately we pay the price pretty quickly. I took a cloche off my chicory seedlings and they were all but destroyed by sparrows in 24 hours. If they had been bigger or later in the season when there are other things for sparrows to eat, it wouldn’t have been a problem. You may prefer to recycle or buy new, or a combination of both. Just make sure you’ve got the protection sorted before you sow or plant. It may need to change as the plants grow to allow for a change in size or season. 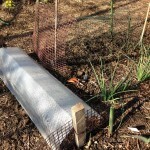 can I dig my garlic yet?